Over the past few years, one of the highlights of the Seattle Solstice Parade and the World Naked Bike Ride has been the appearance of a gentleman who gives spectators enjoyment as he rollerblades along the parade route. According to several blogs, he is identified as Noah Phelps. He's probably best known in his role as Captain America, his body painted red, white and blue. He also has colored himself as a tiger and as an entirely blue specter. 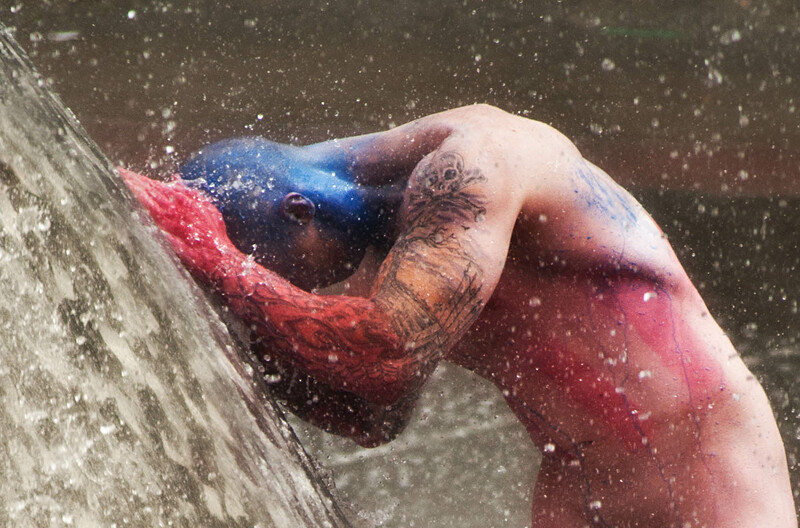 I thought you might be interested in seeing him removing his Captain America pigmentation in Seattle's iconic International Fountain. In subsequent days, we'll look at him in his classic roles. While we're at it, take a look at Noah without his body paint. The finale is a rare indoor photo.